Here is an update from David Wayne. Please continue to pray for him. David's musings about his motives for blogging, whether to glorify God or bring attention to himself, are something with which I identify. It reminded me of this song, I Just Wanna Know, in which Steve Taylor wrestled with his own motivations for being a musician, back in 1985. Am I pulling people closer? But who's the leader gonna obey? Will his head get big when the toes get tapping? I just wanna know are they catching what I say? He was magnetic. The disciples felt pulled into Jesus' orbit. And because prayer is the focus of these midweek Lenten services, it’s on this second thing that the disciples understood about Jesus that I want to speak. With the help of a concordance the other night, I looked at the times that Luke's gospel says that the words pray, prayed, or praying were used of Jesus. He withdrew to deserted places to pray. Jesus went to a mountain to pray all night alone. At Gethsemane on the night of His arrest, you'll remember, Jesus withdrew from the disciples "about a stone's throw" in order to pray. After He was baptized, Jesus prayed, and then the heavens were opened, the Holy Spirit descended on Him, and a voice from heaven said that Jesus was the beloved Son of God. In an incident we looked at recently during Sunday morning worship, while in the company of three of His disciples, Jesus prayed, a cloud descended to the mountaintop where they were, His appearance was transfigured, and a voice from the cloud told the disciples to listen to Jesus. Jesus prayed a lot! I want to caution you against seeing this as a pious request, though. By this point in Jesus' ministry, Peter had made his confession of Jesus as the Messiah and he, James, and John had seen Jesus transfigured on the mountain. But all of the disciples were a long way from understanding Who Jesus was, what it meant to confess Him as Messiah or Lord, or what it meant to pray. One clue to the ignorance with which the disciple asked to be taught to pray is that after he says, “Lord, teach us to pray,” he adds, “as John taught his disciples.” This is club-thinking, like someone at Kiwanis saying, “Hey, the Rotarians have dinners, shouldn’t we have dinners, too?” Or, like ancient Israel saying, "All the other countries around us have kings. We need a king." So, the disciples' request for instruction on how to pray is a bit suspect. But, among the many wonderful things about Jesus is that even when the requests we bring to Him are ill-formed, misinformed, or silly, He still listens to us. Jesus heard the disciple’s request to teach him and the others how to pray, overlooked the ignorance and misinformation behind the request, and gave him—gave us—a model for prayer that can accommodate everyone from the youngest believer to the most seasoned saint. Of course, these constitute the opening words of the Lord's Prayer. It's great to say the Lord's Prayer, as we do in our worship together. But more importantly, this prayer provides a great pattern for our praying and for our personal relationships with God. In The Small Catechism, Martin Luther refers to, “Our Father, Who art in heaven,” as the introduction to the Lord’s Prayer. Here, we’re encouraged to see God not as some distant deity, but as our loving parent who wants to hear from us. When our son first went away to college and our daughter went to Florida to work at Walt Disney World, every telephone call and every email we got from them were important to us. Our prayers can become the telephone calls or conversations with the Parent Who always has our backs, One with Whom we can share our most intimate thoughts, our deepest desires, our greatest fears, worst sins, most noble hopes, and most urgent requests. But after this note of intimacy, the prayer Jesus teaches us introduces another element that should be part of our praying as well. He does it in the words, “Hallowed by Your Name (or Thy Name).” The word “hallowed” means revered, sacred, inviolable, respected, glorified. Pulling those two things together—the loving intimacy of God and the overpowering, perfect, majestic holiness of God—will also, I think, help us learn to truly pray. In Jesus Christ, we know that God is willing to go with us into our deepest valleys and can, if we will let Him, move our biggest mountains. “God is great, God is good,” a prayer we learned as children says. The Lord’s Prayer, in effect, begins, “God is good, God is great.” Either way you put it, it’s wonderful to know that the perfect, powerful God Who is in charge of the universe also is ready to hear from us anytime. It seems to me that knowing these two things is the first step in truly learning how to pray. There are several reasons for that, I think. First: The number of people participating. Consistently, we’ve had good turnouts for each of the gatherings. Obviously, the book—or at least, the issues that it addresses—provokes thought, reflection, discussion, and prayer. Even people who didn’t care for the book came for the discussions! Second: The level of participation. Many people have spoken up and I can say that I personally, have learned so much from the differing viewpoints and reflections people have brought to the discussions. Third: It has taught me that there is more than one way for we adult Christians to grow in our awareness and reliance on Biblical truth. Typically, when I’ve done adult studies, I’ve offered classes on books of the Bible or Biblical topics like, “witnessing” or “The Holy Spirit.” No doubt, I’ll do so again in the future. But stories are powerful things. They don’t intimidate people the way, “Turn in your Bibles to Habakkuk, chapter 2, verse 4,” might. Stories invite us to enter the experiences of the characters at levels with which we find it easier to connect. The power of stories shouldn’t surprise me: Jesus told them all the time; we call them parables. They conveyed truth about which Jesus could have preached or written an essay. Instead, He told stories, making things clearer than they otherwise would have been. 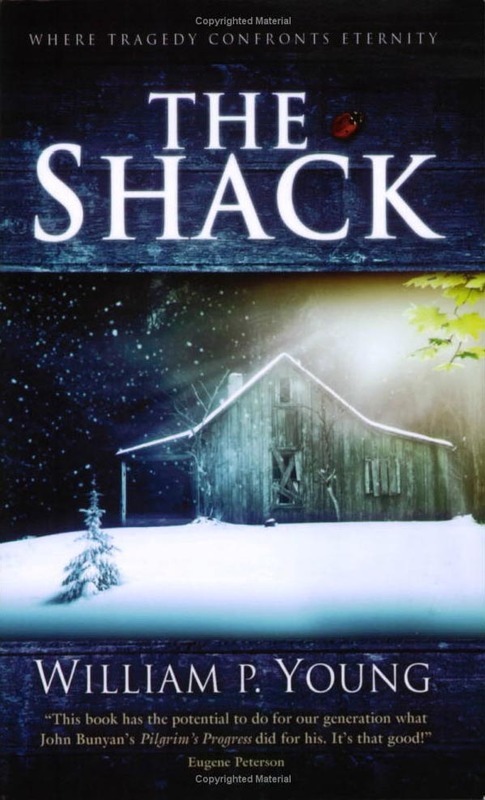 In our discussions of The Shack, we’ve talked about and read the Bible a lot. But we’ve entered its truth through the story, making the Bible’s teachings more accessible and understandable than they might otherwise be. Fourth: We’ve had quite a few participants who aren’t members of Saint Matthew come to be part of our discussions. This has been exciting…and may be a preview of what God has in mind for Saint Matthew’s future. In stagnant or dying churches, the numbers of people participating in the congregation’s ministries are always less than their total numbers of members. These churches, like most organizations, operate by the old 80/20 rule: 20% of the members are involved in 80% of the activities. In growing churches though, different numbers are evident. In all their ministries, be they educational, servanthood, worship attendance, youth groups, or whatever, more than just their members participate. That’s because the members of growing churches are outwardly focused and they’re always inviting their friends—especially their spiritually disconnected friends—to be with them for worship, service projects, youth activities, or discussion groups like the one we’ve been experiencing on The Shack. That’s why it was so fun to see what happened with The Shack discussions. Members of Saint Matthew invited their friends, some connected to churches and others not. The result has been a month-and-a-half of get-togethers that have been enjoyable, enriching, and fun. Faith and fellowship have been fostered. On February 22, we had what should have been our sixth and final discussion of The Shack. But we decided to meet two more times, on March 2 and 9. You’re invited for those final two gatherings. The sessions run from 7:00 to 8:30pm. We also decided that after Easter, we’ll do another book discussion group. We haven’t decided what book we’ll discuss, though several titles have been suggested. If you have a book that you’ve always wanted to discuss, let me know, and when we start the next set of discussions, I hope that you’ll be involved. You won’t regret it! *For those unfamiliar with this best-selling book, it’s a Christian novel that avoids both sappiness and academic dryness. As I’ve told people, it’s not the best-written novel I’ve ever read, but it relates to real-life issues, which may explain the chord it seems to have touched in millions of readers. There's a story that's only tangentially related to today's Gospel lesson. But I've decided to tell it anyway. It's about a sheriff who had a vacancy on his staff. A guy in the community who wasn't exactly the brightest bulb in the pack wanted to interview and the sheriff didn't feel that he could fairly refuse to give the fellow an opportunity. So, the sheriff sat down to ask him a few questions. "What's 1 and 1?" the sheriff asked. "11," the guy replied. That wasn't the answer the sheriff was looking for, of course, but he could understand how the guy came up with it. "OK," the sheriff went on, "what are the two days of the week that begin with the letter T?" Without hesitation, the guy answered, "Today and tomorrow." Again, wrong answer, but understandable. The sheriff asked a third question: "Who killed Abraham Lincoln?" The interviewee didn't say anything for a long while. He was stumped. "I tell you what," the sheriff said. "You go home and think about that." The man left his interview and out on the sidewalk, ran into some friends. "How did the interview go?" they asked. "Great!" he answered. "It's my first day on the job and I'm already working a homicide case!" In today’s Gospel lesson, Jesus is really experiencing His first day on the job as the Son of God. As our lesson begins, He has just come from being baptized, where God the Father triumphantly declared Him to be the Son--the very presence of God--and the Messiah, when the Holy Spirit drives Him into the wilderness--the desert--to be tempted by the devil. In between the account of Jesus' baptism and our lesson, the gospel writer Luke inserts a genealogy that culminates with the designation of Jesus as "the Son of God." But already during His first day as the Messiah, we find Jesus in a contest to decide whether, as God's Son, He will be faithful to the Father’s will or will go another way. Each day of our lives, we confront the same choices Jesus faced in the wilderness: whether we’ll follow God’s will for our lives or we’ll walk away from God. Like Jesus, we face temptations. Interestingly, the words used in the Greek of the New Testament--peirazo or ekpeirazo--can be equally well translated as test or temptation. Like the two sides of a single coin, every temptation that comes from the devil, the world, or our sinful selves is also a test from God. There were three major temptations that came to Jesus during His forty days in the wilderness. Each was similar to the temptations that God's people confronted in the wilderness between Egypt and the promised land during the days of Moses some 1500 years before the birth of Jesus. Each of Jesus' temptations also reflects the major temptations that you and I face as we move through our daily lives. A famous third century saint, Augustine, prayed, “O Lord, our hearts are restless until they find their rest in You.” Temptation can lead us to try to feed our hunger for the comfort and peace only God can give with other things. Jesus refused to make that mistake. That’s why He told the devil, quoting the Old Testament book of Deuteronomy, “One does not live by bread alone.” We must instead rely on God alone for life! In the second temptation, the devil challenged Jesus to worship him. If Jesus would worship him, he said, Jesus could have all the kingdoms of the world. Truth be told, we all want to reign over our own little kingdoms. Jesus, in fact, had come into the world to take the very kingdoms that the devil offered Him in the wilderness. But Jesus came to take them through a cross and an empty tomb, not through bowing down to evil and separating you and me from God and life forever. Jesus came to save us from sin and death. And He couldn’t do that if He only looked out for Himself. Turn on the television news on any given day and you see the consequences of a world caving into the temptation to put other things—especially themselves—above God. Let the same mind be in you that was in Christ Jesus, who, though he was in the form of God…humbled himself and became obedient to the point of death— even death on a cross. Therefore God also highly exalted him and gave him the name that is above every name, so that at the name of Jesus every knee should bend, in heaven and on earth and under the earth, and every tongue should confess that Jesus Christ is Lord, to the glory of God the Father. True living comes only to those who let God have first place in their lives. The third temptation from the devil took place on the pinnacle of the temple in Jerusalem, where he told Jesus to jump. The devil did a little proof-texting from the Psalms to try to convince Jesus that it was okay. (You know what proof-texting is: It's taking an isolated piece of Scripture, without taking the witness of the whole Bible into account, in order to prove something you believe or want to believe is true.) Jesus could jump, the devil said, because, in Psalm 91, God promises that his angels will spare Him harm. But Jesus quoted Old Testament words in which God warns us not to put God to the test. It’s one thing to be pushed from great heights; it’s another to throw ourselves from them and then expect God to rescind the law of gravity to protect us from the consequences of our own stupidity. In today’s world, of course, it’s tough to own a home and not have a mortgage. But I know people who pile up massive mountains of debt and then say cheerily that they’re sure God will take care of their finances. That’s like jumping from a building and expecting God to catch us. People make the same mistake with all sorts of sins. They like to sow their wild oats and then count on God to bring a crop failure. Jesus knew that to depend on God and His grace is not the same as expecting God to wink at our sin. So, what does Jesus’ encounter with the devil in the wilderness teach us? Three main things, I think. The first is captured in an incident that supposedly happened a few years ago at an Oregon middle school. Some girls there thought it was fun to put on lipstick in the rest rooms and then press their lips against the mirrors, leaving little kisses all over them. This went on for several weeks when the principal called together groups of girls in one of the rest rooms. There, she explained that the lip prints caused the custodian major problems. She then asked the custodian, who was with them, to show the girls what she meant. So, he dipped a long-handled brush into a toilet and scrubbed the lip prints away. Temptation makes sin look attractive. But if we could just understand that when we cave into sin, we're kissing filth, we might not surrender to it so easily. Jesus knew that caving into sin would lead to an ugly alienation from God. We need to know that too. When you young people are tempted to go against the directions of your parents, when you older folks are tempted to fudge a little when working on your TurboTax, when any of us are tempted to berate someone, remember these temptations to violate God’s law of love for Him and love for neighbor aren’t sins unless we wimp out and cave into the temptations. And thank God, when we do sin, because of Jesus Christ, the truly repentant can receive forgiveness and the power to resist temptation in the future. The third and most important lesson we can learn from Jesus’ being tempted in the wilderness is this: At every turn, Jesus was able to resist the devil by knowing what God says in His Word, the Bible. If you and I are intent on having a meaningful life and to be prepared to resist the temptation to walk away from God, the only Giver of life, we need to make our relationship with Jesus Christ our number one priority. God first; no exceptions. It only seems fair when you think about it: God has put us first, so reciprocating seems the appropriate response. When we’re focused on the God we meet in Jesus Christ, we’re empowered to live life as it’s meant to be lived! This Lenten season, as we consider the spiritual discipline of prayer during our midweek services, I ask you to allow a daily time with God’s Word to inform your praying. When we, like Jesus, get to know our Father and lean on His Word, we build a tower of faith in Christ and an ability to really live life that no one and nothing can tear down!